Moving to settle lingering issues involving its ethical conduct, Boeing Co. announced a tentative agreement with the government Monday that calls for it to pay $615 million to end a three-year Justice Department investigation into reported defense contracting scandals. While agreeing to the largest financial penalty ever imposed on a military contractor, Boeing will not face criminal charges or have to admit wrongdoing under the settlement. It also avoids having the matters aired in court. The two sides said the company agreed to pay $565 million to resolve potential civil claims and what was described as a "monetary penalty" of $50 million, along with accepting responsibility for its employees' conduct and making additional commitments regarding compliance with ethics rules. Chicago-based Boeing has been under investigation for allegedly improperly obtaining thousands of pages of secret documents from Lockheed in the late 1990s, using some of them to help win a competition for government rocket-launching business, and separately for recruiting former Air Force official Darleen Druyun while she was still overseeing contracts involving prospective Boeing deals. The government stripped Boeing of about $1 billion worth of rocket launches for its improper use of the Lockheed documents. Prosecutors agreed not to pursue Boeing or its executives as long as the company and its senior executives do not commit federal crimes during the next two years. If crimes are committed and Boeing fails to report the misconduct, the company may be prosecuted or assessed an additional $10 million penalty for the recruitment of Druyun. Details of the settlement were disclosed Monday afternoon by Justice Department spokeswoman Tasia Scolinos and Doug Bain, Boeing's senior vice president and general counsel. Boeing spokesman Tim Neale said the company would have no further comment. The agreement is to be signed in the next few weeks, the sides said. A settlement could go a long way toward helping the company — the second-largest U.S. defense contractor behind Lockheed Martin Corp. — in its effort to distance itself from recent procurement controversies that tainted its reputation. Jim McNerney has made a settlement a top priority since taking over as chairman and CEO last July. Druyun served nine months in prison in 2005 for violating federal conflict-of-interest laws. Michael Sears, formerly chief financial officer at Boeing, spent four months in federal prison last year for illegally recruiting her. While the company still faces pending civil claims by Lockheed, the $615 million payment is less than some analysts expected the cash-rich company to have to make. Justice Department prosecutors reportedly had originally sought more than $750 million in penalties. "What the positive comes from is their ability to really start to put this behind them," said Morningstar analyst Chris Lozier. "I don't think they were losing contracts ... any more because of this, but certainly this would help people erase any question from their minds about whether Boeing was on the up-and-up." Standard & Poor's credit rating agency said the settlement would have no impact on its outlook for Boeing, which it upgraded to positive last Thursday. Analyst Roman Szuper said in a note to investors that the large fines would be manageable for Boeing given its cash resources of nearly $10 billion and continued strong financial performance. 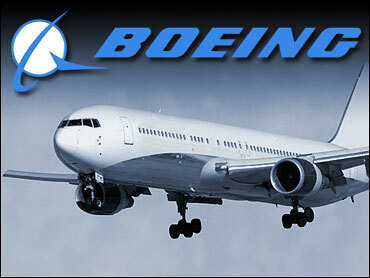 Boeing shares fell $1.15, or 1.3 percent, to close at $85.86 on the New York Stock Exchange. The stock hit an all-time high of $89.58 last Wednesday.